Today: Sweet, salty, crunchy, noodley. It's what's for dinner. Filling, but not heavy. Full of vegetables, but not too virtuous. A little spicy. A lot of noodles. A handful of crunchy, salty peanuts. Does double-duty by absorbing leftovers. Is it the perfect meal? Is it dinnertime yet? We are assuming you already have light brown sugar and a clove of garlic. If not, add those to your list, too! With 45 minutes before dinner, juice your limes. Whisk 3 tablespoons of it with the brown sugar, sliced chile, minced garlic, and fish sauce to make the dressing for the noodles in a small bowl. Use the rest of the lime juice to make yourself a cocktail (like a Hothouse Cooler). Take a sip. Put a pot of water on to boil and assess your produce. Slice up 3 to 4 leaves of the cabbage, the carrot, and half the cucumber. 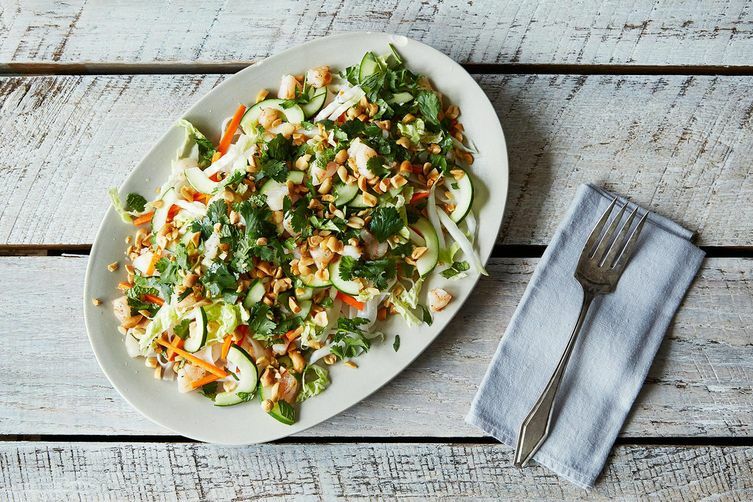 Chop the herbs and peanuts, tear the meat into bite-sized pieces, and set everything aside. Only 10 minutes to go! Boil the rice noodles, drain them, and rinse thoroughly in cold water. Dry them well before serving them in generous bowls with the vegetables, meat, herbs, and peanuts arranged on top. Leave the dressing on the side so your fellow diners can season as they wish—and hope there will be leftovers for tomorrow's lunch. I made an alternate version of this tonight. I had leftover angel hair pasta, some grilled plain chicken tenderloins, and the rest of the ingredients on hand. Made the "sauce," chopped the chicken and added it to the sauce to soak while I prepped everything else. Assembled the noodles tossed in a bit of peanut oil on a plate with the veggies and herbs, then using a slotted spoon, add the chicken. A couple of spoonfuls of the sauce, chopped peanuts, and a few dashes of sriacha on top. A fantastic substitute to my usual bun recipe, which takes at least an hour. Will make it again!